Richard Bruton today announced developments that have been made in line with promised employment rights and industrial relations reforms. 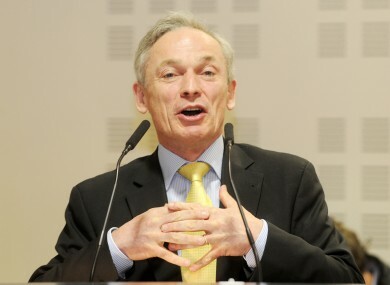 RICHARD BRUTON HAS announced several reform measures to the State’s employment rights and industrial relations services. Currently there are five employment rights institutions and the Government wishes to merge them into two. Today, the Minister for Jobs, Enterprise and Innovation outlined his progress in streamlining the system. So far, Bruton said his department has introduced a single complaint form, one point of contact and a new, consolidated website. The interim site, www.workplacerelations.ie, provides information on employment, equality and industrial relations legislation. The new complaint form will deal with all individual complaints and referrals to the Rights Commissioner Service, the Employment Appeals Tribunal, National Employment Rights Authority, the Equality Tribunal and the Labour Court. It replaces 30 existing forms. inquiries concerning the status of complaints and associated procedures and processes. “This is an important step in the delivery of a world-class workplace relations service that is simpler, faster and cheaper,” said Bruton today after the announcement. Eventually, the Government wants to have just two bodies looking after industrial relations issues in Ireland – a commission of first instance and a separate appeals body. Bruton’s proposals were first outlined last July. “My overall objective is to encourage early resolution of disputes, the vindication of employee rights and minimisation of the costs for employees, employers and Government, in terms of money, time and workplace productivity,” he said. Email “Jobs Minister begins overhaul of industrial relations system”. Feedback on “Jobs Minister begins overhaul of industrial relations system”.